Worth £29.99! Save 20% on tickets with the code PC-GAMER20. Not got your PC Gamer Weekender ticket yet? Well, here's another reason to come join us in London next month, alongside the cool new playable games, panels featuring fantastic developers and hardware workshops. 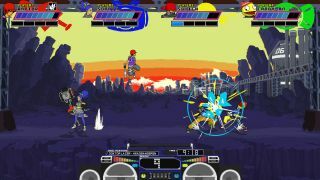 Our friends at Fanatical are giving each attendee four copies of projectile fighting game Lethal League. That’s a £29.99 value, absolutely free, for everyone who attends the show on February 17 and 18 in London—whether you've booked your tickets already or not. This four pack of keys will be mailed to attendees the day after the show, on the 19th, at which point you can jump into Lethal League and hit balls in each other's faces. Share your surplus keys with pals, or maybe even an enemy or two to resolve those unfinished rivalries. User reviews on Steam for Lethal League sit at a very respectable 95% positive, and you can play it in local co-op too. For more details see the site, and follow us on Twitter for up-to-the-minute news. Tickets are available now from £12.99. You can save 20% on the price with the code PC-GAMER20.